Are Chipped Diamonds Real or Fake? If we say that diamonds aren’t the prettiest rocks on earth, a good majority will disagree vehemently. However, like any rock, if hit at the right angle at the optimum part, the diamond can break, crack, split or chip too. In fact, a diamond is structured to react the same way as any beautified rock, and it can be broken the same way too! It is true that, for amateur diamond wearers, the news about the diamond chipping can be woeful, initially. Rest assured, because this is a natural part of diamond wearing. In fact, the older the diamond and history of its natural wear ‘n’ tear, the more the rate of chipping will be. This is technically called such as bearded girdles, chips or inclusions. It is true that chipping of a diamond can be caused by inclusions, which if not conveyed to the customer before buy, the diamond geezer’s ethics is wrong. Freddy Diamonds is a trustworthy seller who sells such diamonds with the rate of inclusions as well. Diamonds with inclusions are further filled with nitrogen or silicone. These treated diamonds are not fake, but neither are they completely crystallized! Make sure to analyze your rock thoroughly, prior to buying to avoid being ripped off with inclusions. It is a fact that most of us merely look at the jewelry with awe in the first look, and forget to actually see the flaws. It is only after a few weeks wearing that the inclusions becomes obvious, provided your jewelry was not appraised at the time of buy. Do Diamonds Crack or Chip? YES. It’s a 100% surety that diamonds can crack even though it has a 10/10 on the MOHS scale. 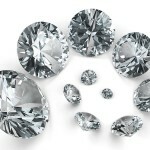 Known as the hardest substance on earth, diamonds are mined with cleavage lines, which are the weak points of a diamond. It is following these lines that a diamond is cut. A little known fact about diamonds is that often 20 carat diamond is mined, but after the cut or polish, mere one carat rock remains, thus hiking its price. A remarkably advanced technique, skillful diamond cutting does make the diamond durable, but does not prevent it from the natural chipping off of the sides due to wear. Depending on how thin the girdle of your diamond is, the rate of it getting bumped or thrust can be vulnerable to the rock. Diamonds with inclusions as well as thin girdles can be resolved to prevent chipping and cracking of it. It is true that, mankind knows diamonds as next to forever. Diamond Heirlooms are regarded priceless and the new wearer often ends up with the cracked rock. It is true that adequate diamond care can keep your diamond alive almost for, forever, but with a smart setting and use, you can be hassle-free about destroying your precious rock as well! Believe it or not, majority of the time, people freak out about their diamonds having chips in it because the hardest thing on earth chipping like chocolate sounds unreal. While diamond chips refer to an exclusive ornamental diamond item, it is not identical to diamond chipping. When the wearer applies a downward movement on the culet of the diamond, chips or cracks can be formed. Pointy diamonds have the same problem and tend to damage with feather cracks along the table, easily. What is the secret between diamonds chipping? Diamonds are all made naturally with inclusions like 1% of nitrogen and other enhancements post mining. Diamonds chip because like any other rock, living or non-living thing, a specific force at the right spot and angle of the diamond can split it too! Needles: It is not just the other elements in a diamond that leads to inclusions, but the diamond crystals itself. While certain needle inclusions highlight the look of a diamond, it is mostly unnoticeable to the naked eye. Cloud: The appearance of a hazy space in a diamond is mostly caused by more than three inclusions in a diamond. It is easy to overlook this when you’re looking at the rock for the first time, but given that the pinpoints are more than one, the diamond might look of a lower clarity and brilliance. Grain Lines: Crystal inclusions in a diamond in grains are called grain line inclusions. Originating due to the inadequate crystallization process of a diamond, these can be a burden to the diamond cutter too. Mostly, these are rocks are polished with the grain lines worsened on them, leading to discoloration at places. Knots: The damaging diamond crystals in certain diamonds surface overtime. These are usually seen as protruding crystals that also lead to lower clarity of the diamond. Cleavage: The cracks that occur naturally in a diamond, concurrent to the crystallographic planes. Cleavages in a diamond are a result of the internal strain and can be worsened due to any forceful downward movement on the diamond. If the same is not cared for, there is a high chance that your diamond can split. Pinpoint Inclusions: Crystals that are white in color, also present inside the diamond are a representation of a point of light reflection. In fact, most pinpoint inclusions do not disturb the clarity of the diamond. Mineral Inclusions: Depending on the crystals of mineral natural inclusions in a diamond, the rocks differ based on the size and pattern of the flaw. These are the common inclusions that make the diamond look dull and hazy to the naked eye. Bearding: Popularly known as ‘dig marks’ or ‘girdle fencing’, bearding of a diamond refers to the grime that settles around the prongs of a diamond due to the passage of time. It is true that bearding forms a thin patina on the edges of the diamond girdle, but it is easy to clean and does not represent a flaw, unless cleaned regularly. Intergrowths: Known as the twinning wisps, these are formed parallel to the crystallization of diamonds, naturally. This can lead to feathers, pinpoints and needles around the diamond in the shade of white. Ideal cut diamonds do not show any intergrowths while fancy cuts do. Etch Channel: Yet other natural remnants of the diamond’s origin are held within the etch channel in certain diamonds. During the crystallization process, when the Earth’s heating liquid seeps into the crystallizing carbon, these end up as thin strands of white inside the diamond, forming tunnel-like shapes. Diamonds are not as lucid an industry as most of us believe. From the endless tales of blood diamonds to poor diamond cutting workmanship, there are many reasons that add to the myths surrounding diamonds and its chipping. These are some of the myths and facts about diamonds. However, it is important to know the technical why of diamond cracking or chipping. Diamond chipping is not caused due to the weaker strength of a diamond, but the tensile strength. Having a lower tensile strength than metals like iron, diamond has a demerit in strength. Simply put, diamonds can split into two halves faster than an iron would! When a Diamond cracks, the loudness will alert you. It is not final destination that you will be alerted by systematic signals on the next red zone for your diamond. When you chip your diamond, if it was not a giant fall for you as well, you will forget it. Diamond is the hardest thing on earth, but when it cracks, there is no earth-shattering sound. We can assure you that! Putting an age on a diamond is wrong if you’re referring to your purchase date. A diamond can be born with inclusions or while polishing and can chip in the first few days as well. If yours has, it is time to crosscheck your diamond appraisal and see what might have given it away! Insurance covers Chipped diamonds too. Firstly, insurance are of different kinds for gems like diamond. To know more about insurance for diamond jewelry and engagement rings, click here. Not all jewelry is covered under the home owners insurance and if you haven’t appraised your ring along with an independent insurance request for your diamond, there are very less chances that the repair services of your chipped diamond will be reimbursed. The above myths are as loud as the biggest hoax of our era- Diamonds are rare. No, diamond is rare, because carbon is everywhere. Diamonds are mined at a big amount; however the technology to ornate it is a gross waste of the rock, hence, making it exorbitantly precious. It does not take a lot but just an appraisal to recognize the true value of your diamond. Apart from approaching a graduate gemologist, there are many ways to recognize if your diamond is going to be chipped in the near future. As a golden rule, remember, when diamonds crack, they crack the whole, not a bit. How good are the prongs? A common problem to most diamond chipping cases arises due to its ill-fitting prongs. Often, with diamonds with inclusions tend to react adversely to the undue pressure or lack of pressure of prongs. Make sure to check if the prongs are strong. If you notice any damages to the prongs, it is definite your precious rock has taken a few blows already. It is common for people to opt for platinum prongs to hold the diamond strongly. Do you have a diamond with thin girdles? If so, how is it secured? Then next most important fact to recognize if your diamond is prone to chipping is by observing the rock’s girdle. For a diamond with girdles that are thin, it is natural to have the diamond chipped. For thin diamond girdles, you must use a conforming mounting to secure the stone. Diamonds with sharp edges are prone to chipping and one must touch the girdles to notice if there is any chipping off, of the edges, table or crown. Is the tension setting right for your diamond? The tension setting of any rock refers to how the rock is secured within the opposite poles of a ring, which tightly holds the rocks amidst. If the tension setting is too tight, there are chances that minor bumps can aggravate the strain on the internal structure of the diamond and cause it to crack or chip. Another issue to the tensions setting is the percentage of exposure that the rock has. If your rock is exposed at the corners or the edges, there are high chances for it to be chipped off while bumping sides or so. How chipped is your diamond? Another significant answer to finding if your diamond is chipped is by closely checking the nature of the chip or crack in a diamond. There are many cases where chipped diamonds have cracked or split due to the undue pressure during the observation of the wearer. It is best to take your diamond to a diamond pro, if you are doubtful about it getting chipped. Do you know the rate of inclusions in your diamond? A common and general fact is that inclusions aggravate chipping of a diamond. In fact, if the inclusions in a diamond are too much, not only will its clarity be compromised, but the strength of the diamond will be low too. Provided you bump the rock at an uneven angle, there are many reasons for the rock to undergo more strain than usual and crack, under such a condition. The best way to recognize if your diamond is chipped is under a 10X loupe or under UV rays. What to do when your diamond is chipped? To start with, it’s not the end of the world, just because the hardest rock on earth cracked. A lot of people have had the misery of inheriting diamonds that are antiques and chipping it. The first rule of having a chipped diamond is to stay calm and store your precious rock safely. If the chipping of your diamond is aligned around the edge of the rock, there are various settings to help you hide the chip. The best is to substitute the current setting with a semi bezel or total bezel setting. If Bezels are not for you, consider multiple claws to fill the void. The best way to hide and secure a chipped diamond is by clawing the right prongs to it at the right pressure. Talon style claws are the most sought after claws for chipped diamonds. The star feature of this claw is that it covers until the crown of the diamond, hence disguising any deep a flaw. Provided that your diamond has minor inclusions, the remedy needs no cutting or resizing. Your jeweler can easily rotate the rock and hide the inclusion under the safe claw. In addition, if the inclusion on your diamond has eaten some space, it is better to solder the diamond with the claw to safely concrete the rock. If you have your diamond covered appropriately under insurance, replacing the chipped diamond will be a hassle-free process. In fact, you can try to converse with your jeweler to replace directly and if the diamond geezer refuses, merely approach your insurance and carry the conversation directly. In fact, there are many couples with Jewelers Mutual Insurance, proudly owning new diamonds owing to their older chipped ones, without compromising their comfort zones. Another smart idea is to cut your diamond. In a technical aspect, this is not a good idea, because if the stone has more than one inclusion, then it is prone to breaking unevenly during the polishing process. Furthermore, cutting can only reshape and reduce the carat weight of your diamond. When the diamond is an heirloom, many wearers opt to cut it than replace its sentimental values! In case you’re freaked out about how can diamonds crack or chip, the truth is that, all of the damages owe it to improper care of the diamond. In fact, there are many ways to protect your diamond from cracking or chipping. Mostly, people opt for cheap diamonds without knowing that there are many values of a diamond compromised to bring its price down. When these relate to the number of inclusions in a diamond, the matter can be worse. If you purchased a diamond without knowing the rate of inclusions in it, it is downright ‘silly’. The truth to be told, you get nothing but, what you paid for! There are many reasons that a diamond looks dull or with lesser luster due to the natural wear and tear. Just like bearding of the diamond girdle, provided you work in an industry where much grime passes through your jewelry, there are higher chances that your jewelry will look jaded. Ultrasonic or detergent cleaning periodically will effortlessly clean the dirt off your precious stone. Another important necessity of any diamond owner is the appraisal of the diamond. While appraisals help to known the value of your diamond, it also tells you the technical basics of how strong or ‘sans inclusions’ your diamond is. In addition to the above, depending on the environment that your jewelry is exposed to, you must decide to change the jewelry. Often, not all diamond jewelry is suited for all types of workspace. It is necessary to carry the jewelry with care and ease without relaxing both. An easy to make sure your diamond is safe is by consulting an expert diamond geezer to help you design your dream jewelry, caring for its durability.